This book is copyright of Mr. Futonge Nzembayie Kisito , Teacher and webmaster of ESL Kids Lab www.english-4kids.com, and covered by international copyright laws.If you disagree with the terms, please don't buy this E-book. The materials you buy are available for private use ONLY. Private use here includes: one to one teaching or learning, using these materials within an educational institution and any educational non-commercial goal with some exceptions. Any commercial or non-commercial redistribution or reproduction of this product or a part of this product or any of our products therein is prohibited. Redistributing these materials on the internet is STRICTLY prohibited even if you are offering them free of charge. Of course this does not mean that you can’t make multiple copies for you and your students or friends as long as you don’t share it publicly on the internet. If you would like to use these materials beyond the licence limitations, feel free to contact me at eslgalaxy@gmail.com for school licences and more. THE BUYER OF OUR E-BOOK IS NOT BEING GIVEN THE RIGHT TO DISTRIBUTE EITHER COPIES OF THE DOWNLOAD OR TO MAKE ACCESSIBLE OTHER COPIES OF THE FILES THEREIN. THE OWNER OF THE DOWNLOADS DOES NOT HAVE THE RIGHT TO LEND OR SELL THE DOWNLOADS OR FILES TO OTHER PERSONS WITHOUT THE EXPRESS PERMISSION OF FUTONGE N. KISITO. THE OWNER OF THIS E-BOOK DOES NOT HAVE THE RIGHTS TO DISTRIBUTE THE BOOK OR PAGES ON THE INTERNET neither by uploading to a server nor sending them by emails. Purchases made on this site are not subject to a refund UNLESS, the password and usernames have not been sent to the buyer within the time specified (which is unlikely for we always send your login details once we confirm payment). We will send your password and details anytime from 30 mins to 24 hours after purchase.But you should wait for at least 2 days before asking for a refund. This is because on few occasions, there can be delays in receiving funds. Also you can send an email directly to us with your receipt if you haven't received your password within the time promised. Usually we respond more quickly during working hours. Your login details will be active for 2 days. Try to download your files within two days after you receive your password. If you haven't downloaded your file within this time, you will have to send an email for us to reactivate your login details, which will be active for another two days only. NOTE : The graphics used in designing our worksheets are copyright of the respective institutions we bought them from. We do not claim copyright for those graphics. We used them with respect of the the copyright terms at which they were sold to us. What's an E-book? - It is a book distributed electronically online? In what format are the worksheets in this E-book? - We built the worksheets in this book in PDF format? What is a PDF file? A PDF file is a document file that is opened using Acrobat Reader, a freeware which can be downloaded here . What's the main difference between an MS Word document and a PDF document? - You can edit MS Word documents in microsoft office. Do I need to install Acrobat Reader? Yes, but it may not be necessary since most computers come with Acrobat reader already installed. Check to see if your computer has it. Do I need to pay for Acrobat Reader? - No, it's free. Download an upgraded version here. What other formats are the exercises in? WMV, PDF, WORD, MP3, PPT which are easily available on 99% of computers. Why is the E-book a zip file? - We need to get you this e-book in one full piece and the best way is first putting it in a folder and then zipping that folder as one zip file bundle . Without which you will have to download each file individually and that can take a whole day. What's a zip file? - The ZIP file format is a popular lossless data compression and archival format. A ZIP file contains one or more files that have been compressed. What do I do when I download a zip file? - You need to extract it to access the contents inside. How do I extract your zip file? - If you do not have a Zip file extractor software already installed, Download 7-zip here or here and install. After installation, right click on the zip file you downloaded and choose 7-zip from the menu. Choose the option extract here. It will extract to a folder with the same name. How large is this E-book? - It is about 230MB large. Why is the file so large? - The content is full of rich printable and multimedia files. Most often, high quality files mean larger file sizes. Can I download this book on a slow internet connection? – Yes, but we recommend using download accelerators like FLASHGET or STAR DOWNLOADER . These are freeware that you can download and install on your computer for faster downloads. Are the files compartible with all OS? This ebook can only be used on WINDOWS OPERATING SYSTEMS. However MAC users can have a non-exe file but we cannot provide much technical assistance to MAC users. The procedure is a bit more complex for Mac users so Mac users should send an email after purchase indicating what kind of system they have. Who is this book suitable for? 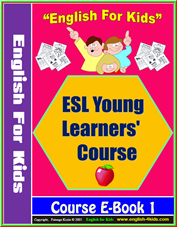 - This book is suitable for teachers of young learners, beginner and elementary English learners mostly.We recommend taking a tour of the content to make informed decisions before purchase.The last thing we want is an unhappy buyer. How do I access the contents? - Inside the main folder you downloaded, there is an book 1 content .html file. Click on that file and a browser will display the content page. Click on each unit view the resources. You can also use the built-in search engine. When I click on the tumbnail it takes me to a blank page - In the preview version, the links to the PDF files have been taken off. After purchase, your download will definitely have the PDF files linked. What if I don't get the login details within 24 hours? - In the unlikely event of you not getting your login details, send us an email with the purchase receipt. What should I watch out for when buying? - Make sure your mailbox is not full or turned off.Also use a valid mailbox. Take a tour of the content to make sure it meets your needs. Is payment refundable? - Yes and no. In the unlikely event of you not receiving your password within 2 days and having written an email and not heard from us, you can launch a complaint to the payment agency (paypal.com). They will investigate and if your claims are correct, you will get your money back. We are VERIFIED PAYPAL members, so that means your security is guaranteed when you buy from us. Also, some customers mistakenly pay twice for the same product and so we give a refund, but a small service charge is taken off by paypal. Feel free to send in questions that have not been asked to- englishmedialabATgmail.com - replace AT with @, this is an antispam messure.